Making your home green does not always mean replacing with green materials, but finding ways to make what you have last longer. This can be a challenge on a roof, but it is possible. Typically, most roofs are said to last for fifteen to twenty five years, but those roofs could last much longer if you consider adding the roof system to your maintenance schedule. I mention system because when I was talking to a friend about his roof, I pointed out how different elements from the interior to the exterior will effect the life of his roof. Elements of this system include the roof covering (shingles), the sheathing and how it is protected, roof penetrations, ventilation features for the attic, framing in the attic, and the gutter system. I frequently mention some of these items in my inspection reports, and I have mentioned most of the items that I plan to detail in this post, but it is nice to have it all in one place. However, there have been developments in roofing technologies, so there are a few items here that I have not dealt with before. Uncaulked	or badly caulked heads of fasteners of shingles, flashings, vents, or mounting brackets on the roof. A nail or bolt can rust which allows the rain water a way into the attic. A small leak can cause a great deal of water to enter the home over time. The solution is to recaulk the fasteners with a tube of roofing caulk. The tube will cost around $5 with a caulking gun costing around the same. It takes about a half an hour to go over most roofs. Be sure that you are using a caulk meant for roofs. Each caulk is formulated for the task at hand, and a bathroom caulk can easily breakdown when used on a roof. I find that most exterior caulks need to be checked	after five years, but they may last the life of the roof. Pruning trees and bushes away from the roof. The brushing of	branches against the roof covering helps to break it down. Once the	covering is breaking, water has the opportunity to penetrate the roof. The worst case scenario that I witnessed is a large limb took	of the roof covering and sheathing down to the framing. Leaf debris left on the roof. Leaves help keep moisture on the roof surface, and that moisture can make its way down to the sheathing. Soak any item with water long enough, and it will weaken. A few leaves may blow off of the roof, but larger piles when moist will stay in place. Every so often you just need to go up there to sweep these leaves. The other problem with these piles of leaves on a roof is that they may great homes for pests. I found a colony of ants living in one pile. They were beginning to use parts of the composite shingle to build a home for themselves (thereby deteriorating the shingle). Not commonly considered, and admittedly probably the least worrisome is simple weathering. I replaced some shingles on my brother’s roof after the hurricane, and you could see the light brown shingles had turned dark. Pressure washing a roof is not a bad idea. The concern is that you should not use a high pressure, because you do not want to destroy the surface of the shingle. 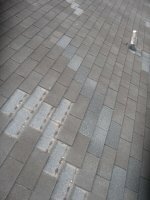 The small pebbles on an asphalt shingle help protect the shingle from UV light. Cleaning gutters. Gutters are great for the home. Many people do not want them, since gutter maintenance is frustrating. Gutters perform a vital function though, directing water away from the home. The problem with gutters that are filled with debris is that they help the debris build up on the roof, or they help the water flow back on the fascia, causing it to fail. Maintaining a venting system for the attic. In most homes, you have vents in the soffits which bring air into the attic that moves along the sheathing to a vent in the ridge. This helps move moisture out of this space. It also helps the temperature in this area. A fully sealed attic with no vents can be like an oven, which helps the elements in the attic breakdown faster. After the hurricane, I saw many homes in Houston that had rows of shingles missing, and the typical response was to have an entirely new roof installed. I imagine that roof and fencing projects are prominent in our land fills after a storm. Adding new shingles to replace missing or broken shingles is not that hard. Composite shingles can be cut with a utility knife, and a long screwdriver can be used to lift up the old shingles. You just need to follow the line of previously installed shingles. Ensure the nails used are covered by the row above the one being inserted, and line the shingle so that there are no open areas leading down the sheathing. I was coming back after a home inspection when I saw a roof that had been painted. It looked bad. The paint was peeling, so you had various spots of different colors. The paint appeared to be a regular house paint. I had never considered this option, and I thought the paint would always end up like this house. I then did some research on the matter to find that there are products being manufactured for painting roofs. If you have a roof that looks like it is at the end of its life, these roof paint products can be a great means of saving money. You will need to clean your roof’s surface as the first step. As mentioned above under tip 4, using a pressure washer can work on roofs, but you cannot have it at the highest setting. Start with low pressure to see how it is working, and then build the pressure up gradually to a setting which cleans without damaging the integrity of the covering. The next step is using a base coat supplied by the paint’s manufacturer. To make this method work, do not skip the base coat or using the appropriate base; otherwise, you will end up with the peeling paint that I saw. Then you can apply the top paint coat. From the different product sites describing this paint, I have the impression that applying the product is not really that different from steps and procedures for an interior wall, that many of us are familiar with handling on our own. There is one big safety concern: think about how you are going to stay safely up on your roof when painting it. When I hear “new roof”, I think of how the term is used in the industry. It means taking all of the covering off of the roof to go down the framing, and then adding new sheathing, roofing paper, and shingles. Most homeowners consider a new roof just to be a new roof covering. You can save some money and time by placing a covering over your existing shingles. You can only add one new layer of shingles over your existing shingles. I am considering composite (asphalt) shingles here. Clay tile, slate, metal roofs do not lend themselves to another layer. If the roofer does not need to remove and cart away the existing covering, you do not need to pay him for his time or for a dumping fee. You can consider this a “green” option by the fact that you are not sending items to a landfill. I mentioned that you can only add one set of shingles over your current roof because of a weight restriction. The shingles can weigh quite a bit, and additional weight on the roof has two side effects. The weight begins to damage the framing which was engineered for a certain load, and the weight needs to be carried down to the foundation, which goes through your walls. As this weight pushes your walls down, you will see cracks in them. A roof can handle two coverings without these problems. How can you know if your roof already has a set of shingles underneath the ones that you are seeing? Of course taking apart the roof will show you everything, but there is a simpler way. Set your ladder to go up on the roof, but you just want to take a close look at the shingles coming over the drip edge. You should see two sheets of shingles if you only have one set of shingles installed on the home. A starter course is used, and then the visible shingles are placed onto the first course. If you see three or four layers, then a second set of shingles has been added. After my current composite roof nears the end of its life, I have this plan to extend it. First I am going to paint it with a light colored paint. The lighter color causes the sun’s rays to bounce off, so the attic does not absorb the heat from those rays. (If you do not like a light color, check out if a darker paint has low absorption rate of heat). Once that paint job begins to wear out, I am going to see which synthetic roof fits my aesthetic of that moment to have it installed over my existing roof. Once that wears out, let’s see if I can paint again. That should keep that material out of the landfills for some time. If you have any questions or suggestions, why not post them in the comments section. I would like to hear from you. This entry was posted on Wednesday, January 14th, 2009 at 5:37 pm	and is filed under Green home conversion. You can follow any responses to this entry through the RSS 2.0 feed.